Earlier this year, Blue Water Shipping announced a major contract, in connection with the TCO FGP project, with a value of US$350 million. For this project, Blue Water Shipping is leading a consortium in partnership with Topaz Marine and Energy which will supply 15 specially designed MCVs for the transportation of modules through the Russian river systems to a new offloading facility in Prorva, Kazakhstan. 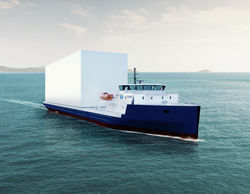 The new contract includes two additional Module Carrying Vessels, of the VARD 921 design, measuring 123 by 16.5 meters. Both vessels are scheduled for delivery in Q2, 2018 and the contract value is in excess of US$ 40 million. The 17 vessels will be used to transport modules weighing up to 1800 tons from the Baltic and Black Sea, via the Russian Inland water ways, to Prorva. Last month, Blue Water also signed a contract with TCO for three larger vessels, which will be used to transport modules from Kuryk (in the western part of Kazakhstan) to Prorva. This contract was also awarded to a Blue Water led consortium. Tengizchevroil LLP is a Kazakhstani partnership exploring, developing, producing and marketing crude oil, LPG, dry gas and sulfur. Current partners are: Chevron, 50 per cent; KazMunaiGas NC JSC, 20 per cent; ExxonMobil Kazakhstan Ventures Inc., 25 per cent and LukArco, 5 per cent. Blue Water Shipping is a global provider of tailor-made transport and logistics solutions specifically designed to meet the requirements of our clients. No matter the destination or type of cargo we add value and work in close cooperation with our clients – building mutual trust and personal relations. Our solutions include IT-systems, which can easily be integrated with clients’ technology. More than 1,200 expert employees from over 60 offices worldwide, and a comprehensive network of business partners makes us flexible in creating the best solutions to any challenge.